Dr G Yunupingu, indigenous musician, has died at age 46. The highest selling Indigenous musician in history has passed away at age 46. Dr G Yunupingu, the blind indigenous singer whose debut album in his native Yolngu language went triple platinum, has died in a Darwin hospital. He was just 46 years old. It is understood the singer had been receiving dialysis and had been ill for some time. His family are expected to be offered a state funeral. In line with Indigenous tradition, Mamamia has chosen not to publish Dr Yunupingu’s image or full name at this time. Dr Yunupingu was part of the band Yothu Yindi, best known for their 1991 hit Treaty, before he released his first solo album in 2008. The album, Gurrumul, which featured his soulful and emotive voice, peaked at number three on the ARIA charts and went triple platinum in Australia and silver in the UK. The album also hit the top 10 in both Switzerland and Germany. His music label, Skinnyfish Music, described him as a “great Australian” in a statement released after his death. 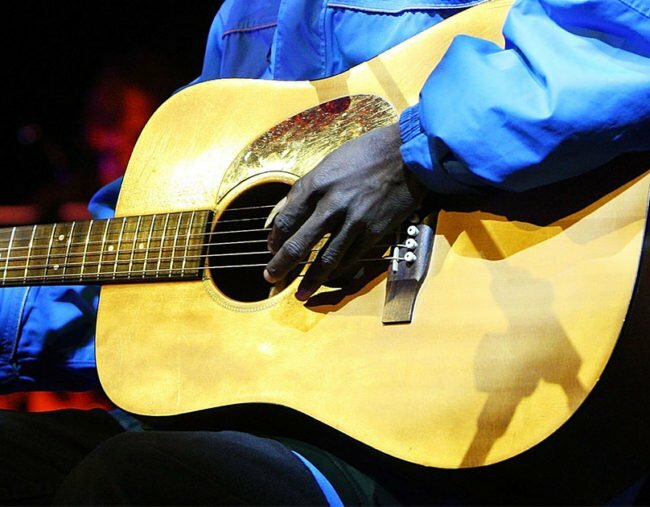 “Dr G Yunupingu is remembered today as one of the most important figures in Australian music history, blind from birth and emerging from the remote Galiwin’ku community on Elcho Island off the coast of Arnhem Land to sell over half a million copies of his albums across the world,” the statement read. Dr G Yunupingu released two subsequent albums, which both made the top five in the studio charts, and won a number of ARIA Awards. The highest selling Indigenous artist in history, he has also performed alongside Stevie Wonder, Delta Goodrem and Missy Higgins and has entertained audiences including Queen Elizabeth II and Barack Obama. “Dr G. Yunupingu also gave back to his community as the driving force behind the G. Yunupingu Foundation, creating opportunities for young people across the Northern Territory,” his record label continued. The tributes for Dr Yunupingu had already begun to flow in the early hours of Wednesday morning. Midnight Oil frontman and former federal government minister Peter Garrett also took to Twitter to mourn the loss. My dear friend Dr Yunupingu – a truly great musician – is gone. Very sad news. Too young, so much left to give. Heart goes out to family. A documentary about his life is scheduled to premiere next month at the Melbourne Film Festival.